C.A.R.E. Connect is the web-streaming version of C.A.R.E. Programming that can be viewed on patient portals and mobile devices. Specifically designed so that healthcare providers can expand on the therapeutic benefits of The C.A.R.E. Channel, C.A.R.E. Connect may be accessed by patients pre- and-post discharge or during their admission. 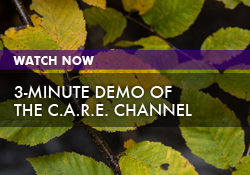 Combining stunning nature imagery with soothing instrumental music, C.A.R.E. Programming creates a window to the outdoors and helps ease anxiety for patients and family members, whether in patient rooms, waiting areas, exam rooms, or even at home preparing for their hospital or clinic visit, or recuperating. 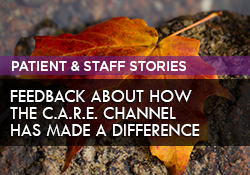 Staff, too, can access C.A.R.E. Connect at their desks, as they seek respite from the stress of their job in staff lounges, or at home. Responsive to the natural cycles of day and night, daytime programming is followed in the late evening hours by a midnight starfield that helps promote sleep. C.A.R.E. Connect also allows access to C.A.R.E. with White Noise, which features a variety of 10-hour long options using white, pink, and brown noise that will help patients relax and sleep peacefully by masking other intrusive and unwanted sound. C.A.R.E. with White Noise is audio-only programming.